Yes, this is a comic that is basically a giant pun. But I couldn't not draw it when I thought of it. I probably should not assume that everyone either knows about Anne of Cleves' Holbein portrait or has read Anne of Green Gables but here we are. 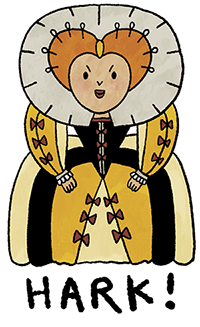 Anyway, everyone knows that Anne of Cleves was the raddest of Henry's wives, divorced and living in her party castle. Go Anne! Keep that head, gurl.